I never really thought that I was a soaps kind of a person. What I mean by a soaps-kind-of-person is someone who watches every episode Live when its first broadcast, gets the irony, feels it has a connection to his/her life, and wants the best for the characters! Definitely not me. Over the last few months I have discovered I am a hopeless soap lover! I watched Grey’s Anatomy back-to-back from the first season to the most current one, so that when the latest season starts am up to date. How did I manage to do it? 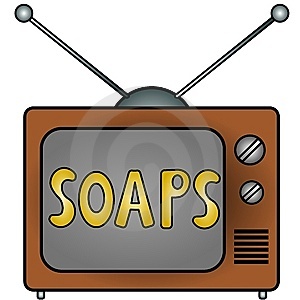 Well over a weekend of no studies and only one thing – you guessed it – soaps! It was amazing, I did know the story line but still continued to hope that it wouldnt turn out the way I knew it would since that was not good for the characters. So now! you can start thinking that I am the crazy soaps person. Now lets go beyond the obvious, what makes some people- soap people? What is that the soap people are selling? What is that people like me are buying? Is it a choice at all of what we need we buy or what we get we buy? How does one not buy if at all there is a possibility? From how they look, to what they wear, to what they drive, where they live – what they eat everything matters. Ofcourse this is the surface of the matter. They are not just selling us the illusion of a life we think we want, they are selling us the dream of something that we maynot have but think we want. So they are selling an illusion. What are we buying? We are buying the dreams that we had but knew that they were dreams. We are buying an image that we think we can be or may be are. So in turn we buy the illusion for that short period of time that we live through the soap characters – rather vicriously. We yearn the ‘perfection’ (by perfection I mean not the glitches that we seem to have) that they have in their language, jokes, life’s drama, coincidences and everything that they do. Currently am loving it! Watch grey’s anatomy and gilmore girls.. going back to back on each of them.. and I cry and laugh and I hope and pray that everything goes fine with them! Sigh and the love affair continues!